The Daily News of Open Water Swimming: What Is True? What Will Happen At The 2020 Olympics? What Is True? What Will Happen At The 2020 Olympics? Courtesy of Stephen Wade of the Associated Press, Odaiba Marine Park, Tokyo. "With all kinds of misinformation about water quality in Copacabana Beach promulgated by the Associated Press before the 2016 Rio Olympics, some national governing bodies like USA Swimming implemented different procedures as a result," recalled Steven Munatones. "After the Associated Press published information about the water quality in Guanabara Bay, publications like the New York Times and SwimSwam wrote critical articles about the open water swimming events at the 2016 Rio Olympics. This misinformation was followed up by responsible investigative reporting by Bonnie Ford of ESPN [see here] that came up with different conclusions than the New York Times and SwimSwam. I had visited Copacabana Beach numerous times prior to the 2016 Rio Olympics and swam in Copacabana Beach as did thousands of people on the days I was there. I did not find any evidence that different American publications had claimed - and none of the Olympic marathon swimmers or triathletes fell ill as these publications had predicted." But the opposite appears to be the case at the 2020 Tokyo Olympic Games marathon swimming site. "FINA, the International Triathlon Union, the IOC and the Japanese organizing committee acknowledge there may be some water quality issues, but they claim the water quality problems will be solved by the 2020 Olympics," said Munatones. "However, I have visited Odaiba since 1988 and the water quality is most definitely an issue - and has been for a long time. Tokyo Bay is not only a heavily trafficked body of water, but it sits along a large metropolitan area of nearly 20 million people. If there is one rain before the Olympic 10 km marathon swim, the amount of urban runoff into the bay will be tremendous. 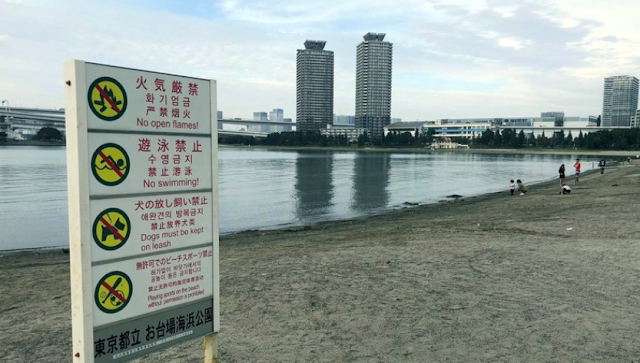 The Japanese swimmers who have competed in this venue will not publicly address this problem or complain, but they all know of the illnesses and hospitalizations that have resulted from swimming in Odaiba. It is a well-kept secret." On the other hand, the Associated Press reports that "...the Rio de Janeiro Olympics in 2016 were plagued with severe water pollution, from rowing events to open-water swimming..." and "...[Odaiba] park for decades has held many national open-water swimming competitions." "First of all, the Rio Olympic 10 km marathon swim venue was not plagued with severe water pollution. That is just plain false. Since I have lived in Japan since 1988, I have only known of a few national open water swimming competitions being held recently in preparation of the 2020 Olympics - and this is where the Japanese competitors have fallen ill. So I do not understand - or agree with - the Associated Press' reporting. In the same way, I did not agree with the reporting and predictions of the New York Times or SwimSwam before the 2016 Rio Olympics," said Munatones. Dennis Miller, the most powerful man in open water swimming as a FINA Bureau Vice President and liaison of the FINA Technical Open Water Swimming Committee promises, "The Rio water quality for Marathon Swimming was fine...this [problem in Tokyo Bay] will be rectified I’m sure...remember the horror stories about the Serpentine in [the 2012] London [Olympics] - that was sorted as well." The Tokyo Olympic organizers have planned a system of layered screens in Tokyo Bay to maintain bacteria levels within safe limits agreed to by FINA and the International Triathlon Union. With the daily tidal flow in and out of Odaiba Marine Park, the screens will reportedly be an effective and efficient barrier to water pollution and bacteria. Time will tell and the swimmers and triathletes will all hope there is no major rain before their races at the 2020 Tokyo Olympics.